Last week I went with friends to see the movie “Into The Woods” at the Riverview Theater in Minneapolis. Afterwards, as we walked from our cars into a restaurant for dinner, one friend began making up her own silly lyrics to “No One Is Alone” a song from the musical. We laughed and sang made-up snippets for a few minutes. My contribution was “But I am alone! Regardless of your lyrics…We are ALL alone!” After we all chuckled at that, I surprised myself by launching into a bit of a tirade on the subject. “That song’s a crock, anyway!”, I exclaimed. “The truth is, everyone is alone. Everyone. We are all alone. That’s the reality of the human condition.” But we were in happy moods, and my outburst came across as humorous and less bitter than it might under other circumstances. We ate dinner, talking and laughing – just enjoying the company of good friends. Later, when our waitress sensed we were finished with our meals and preparing to leave, she stopped at our table to ask how we would like the bill. I indicated that it should be split, my friends’ charges were together, while mine were separate. As she walked away from our table, I sang softly, “I will pay separately because…I am alone!” We erupted into laughter again. …we are on our own when it comes to making the daily choices and decisions that define who we are – no matter how connected to others, only we can choose whether to be true to our deepest selves as we go about living each day; we can never truly know another person’s heart or mind, housed as we are in the solitude or our own, seeing with our own eyes through very personal filters; and (as I learned in existential philosophy courses in college) facing the end of our days – the great transformation known as death – is the ultimate solitary endeavor. …we humans are built with a need for connection and community; we reach out in love and friendship toward others – we have families and tribes and neighbors; even when we are without direct interaction we have writers, artists, musicians whose work speaks to our hearts, whispering that we are understood; in moments of fear or despair, we often find unlooked-for hands reaching out to help or to soothe; and we have an internal urge to seek out an enlivening Spirit, sometimes known as God (which I learned in existential philosophy courses in college is a fallacious crutch, but which I have experienced as very real) a presence in our universe that accounts for countless moments of grace and giftedness is our lives. That night, I dreamed a recurring dream I sometimes have. In my dream, I have somehow come to be at the foot of a rocky wall of boulders and sheer cliff faces. On the plain atop the wall, is a place – and people – I need desperately to reach. The only way to get there, without miles of detouring on foot, is to climb. Even in my dreams, I have a healthy fear of heights. But there are many good hand- and foot-holds, my dreaming mind reasons, and I should be quite able to reach the top. And so I begin the arduous climb. As I pick my way upward, the climb seems to grow longer, becoming an endless upward path. Now that I am fully engaged, and more than partway up the scree, I have no choice but to continue climbing. My muscles fatigue, my body becomes weary and drenched with sweat. Just as my spirits flag and I begin to despair of reaching the top, I look up to see that I have finally progressed past the halfway point. This renews my energy, reminding me of the urgency of my quest. I climb with vigor, and feel myself equal to the task. However, in the first flush of self-congratulation, I look up a final time and see, to my sudden dismay, that the lip of the wall has extended out over the rocks I’m climbing. I stop moving, clinging to my spot on the rocky slope, so close to my destination that I could touch the flat plain, except for the barrier that now extends over my head. I am flooded with disappointment, which quickly turns to despair. When I have dreamed this dream in the past, I have had to face the choice of climbing back down or of attempting a feat of physical prowess and strength that even my dreaming self knows is beyond me. Often, I wake at this point, my heart beating erratically and my breath labored. But this night, something different transpires. As I cling there, scanning the rocky lip of the canyon, I notice a spot off to my right where the lip of smooth rock is broken. Under this spot are a couple of jagged rocks that, if I wedge my foot against them just right, might afford me the ability to reach the lip and haul myself up. Suddenly (and miraculously, as things sometimes happen in dreams) I remember that I have a bar towel in my back pocket. I remember a friend handing it to me in a flash of dream memory that hadn’t existed until that moment. I might, I reason, be able to fling the towel around some purchase at the top and use it to pull myself up the last bit. Though moving across the rock face is daunting, I now have a plan and my towel – so I face down my fears and scrabble sideways. Watching myself in the dream, I know it isn’t pretty as climbing goes. But it works, and I make it to the spot I have zeroed in on. Taking the towel from my back pocket, I look for some bit of rock or vegetation on the edge of the plain. Seeing none, I decide to blindly cast it up, an end in each hand like a very short jump rope. To my surprise, it catches! Relief sweeping through me, I lean away from the wall, my weight held by the towel, and pull myself up and onto the plain. The last thing I see before I wake from the dream is what the towel has caught on: not a rock or a stunted tree, as I had envisioned. But a human hand. Lying in bed, the emotional residue of the dream floating in the atmosphere of my dark room, I realize the Truth embedded in my dream: we are all alone in our climb, but none of us makes it successfully to the top without grasping the hand of another. Looking back at my own darkest moments, the light that appears and offers both help and hope is always shining from the face of someone else. Whether that light comes in the form of a helping hand, an unlooked-for gift, or a simple card reminding me that I am loved, it shines with enough power to illuminate a way forward or, at the very least, a way to regroup before the next push. And because it is true that I have needed the help of others to survive and thrive, that I have relied on the hands that have stretched out toward me, it is vitally important that I strive to sometimes be that hand for someone else. I may not be able to fix their problems. I may not think I have applicable skills to offer “real” (or concrete) help. But I can offer something, even if only a friendly presence, encouragement, emotional support. Or more simply stated: love. And this paradox, I see, is the truth of the human condition (though I doubt anyone will ever learn it in an existential philosophy course in college): we may be alone, but no one need be alone. A simple, but powerful, truth. Note: In the five or so years I’ve been faithfully posting to Jenion each Thursday, I have rarely written a post to or about a specific individual. When I have, it has generally been with good reason. Today, I want to share about someone who holds a special place in my life. If you are a faithful reader of this blog, you’ve read lots of references to my friend, Mike, but I’ve never devoted an entire piece to him outright. That changes today: on the occasion of his fifty-fifth birthday and in celebration of the two year anniversary of the transformational journey he has been committed to in his life. Please join me in wishing Mike a happy birthday and congratulations! 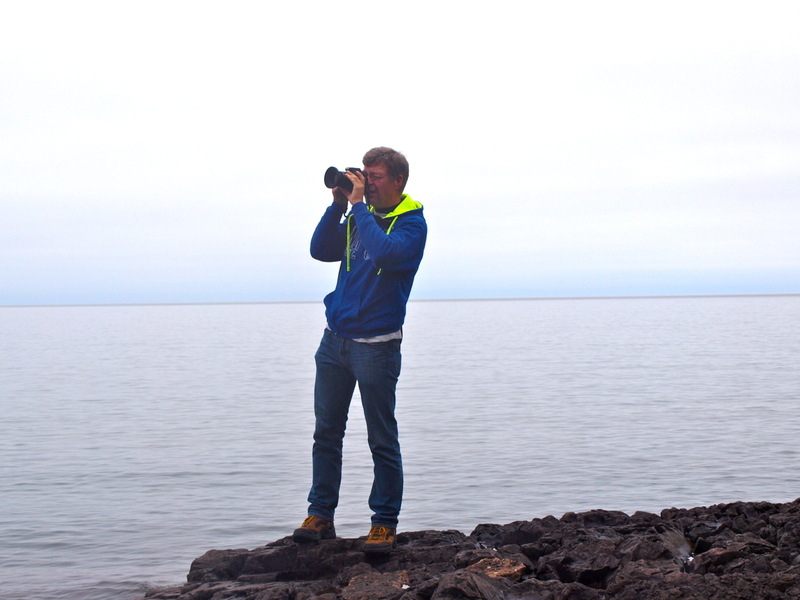 Mike, doing something he loves, Lake Superior. A person’s life story belongs to them. How that story is told, the ways it builds and is resolved, the character revelations, the plot twists and turns – these are all elements of a very personal narrative that each of us should be allowed to share in our own way and with whom we choose. That said, where people’s lives intersect, when they connect, there is a new story written. I’d like to share the story of such a connection in my own life, and what it has taught me about friendship, motivation, discipline, and inspiration. When we met as college students, Mike and I were both emerging from childhood, a little enraptured with life, a little discombobulated by the exigencies of adulthood. Between us there was an immediate recognition – we moved speedily from introductions to inseparable. Not only were the two of us close, Mike quickly became part of my family. He played piano in my sister’s wedding and, two years later, was best man in my brother’s. But as sometimes happens, time and distance separated us. After Mike moved to California the fall of my junior year of college, we tried to stay in touch. When he, eventually, brought his fiancé to Iowa, I invited them to a homemade dinner at my first apartment (I still remember the menu from that meal!). The last time I saw Mike for decades was at the Iowa reception following their San Francisco wedding. Often over the years I wondered about Mike. He had been a significant enough person in my earlier life that friends I met years after we lost touch knew him by name from my stories. I was the last person I knew to purchase my own computer – with my tax refund in 2009. Sometime, months later, I joined Facebook. It was only a matter of weeks once that happened before I began reconnecting with college friends. One day, I saw a post Mike had made on a friend’s timeline. I was so excited to reach out to Mike, to touch base again, that my fingers shook as I typed a brief hello. As with our college selves, both Mike and I were emerging from other phases of our lives. As it happened, we were both finally moving forward, if incrementally, from years-long rough patches. We had each scraped our own personal rock-bottoms, and the road leading from these low points was littered with boulders to be climbed over, black ice to avoid, and quicksand that threatened occasionally to pull us under. Our friendship grew and was strengthened by a sincere desire to be one another’s cheering section and helping hand. “Need help moving into a new apartment or even a new city? I’m there.” That’s how we roll. Two years ago this week, Mike called me (I was still living in Iowa then) to say he had hired a personal trainer. Mike had previously lost a chunk of weight working on his own, but wished to push himself further in reaching his health and fitness goals. Over the following two years, Mike has made incredible strides – he lost 75 pounds and dropped his body fat percentage to single digits. When he first met his trainer, Joe Cross (Cross Fitness), Mike told him, “I don’t run.” Ha! I was cheering at the finish line when Mike ran his first-ever 5K (and at several since). At each turn of the calendar, Mike has set new goals for himself and blown past them. It hasn’t always been easy, but he has remained both diligent and committed. But that is Mike’s story, and I don’t want to presume to say I have all of the details or the “skinny” on what was happening in Mike’s heart, mind and soul. What I can, and will, share is what I’ve felt and learned as Mike has faced each obstacle or stepping stone in pursuing his own definition of personal excellence. First, there are few things more beautiful than seeing someone you love bloom into full flower (sorry, I know that doesn’t sound like a very masculine metaphor but it fits!). The truth about discovering your own inner strength and drive to achieve personal goals, as Mike has, is that it suffuses every part of your life with life-giving nourishment. Not only has Mike’s physical self changed for the good, his whole life has opened up – with new friends, new interests, and a new youthfulness that starts at the cellular level. It brings me real joy to behold this new life of Mike’s – and it never ceases to remind me that this is possible for each of us, if we’re willing to put in the work. Second, I have rarely known anyone who approached a personal vision with the level of self-discipline Mike has shown on his two-year odyssey working with Cross Fitness. Mike embodies the phrase, “Discipline is choosing between what you want now and what you want most.” The number of times Mike’s choices have brought that phrase to my mind have been instrumental in helping me make better choices myself. I am grateful each time that his example inspires me to choose well. Third, it has been humbling to be close enough to Mike’s life to witness the inspirational impact he has had on others. Mike has always been an extrovert – he collects friends in virtually every situation he enters in his life. His joyful exuberance, his obvious good health, his visible physical transformation have truly inspired many of these friends who aren’t quite where they wish to be. They have reached out to Mike with questions and received both support and great advice on beginning their own transformations. Additionally, Mike always remembers to praise his trainers, never taking their roles in his achievements for granted. I wish I were half as creative in finding ways to give back to those who have offered me their support and expertise. Finally, and most important, I’ve had the great gift of being present for moments when Mike has had to dig deep to find the courage to face deeply personal challenges. This work of self-transformation is never a smoothly-paved path. And while I won’t share specifics (those are Mike’s to tell or not), I will say I’ve watched him fight his fears and insecurities and rise to the challenge when the path has gotten difficult. In spite of white knuckles, shaking limbs, and heart in his throat, Mike has repeatedly chosen to move forward when he could easily have retreated. Most others wouldn’t have known, and among the small circle who did, none would have judged him harshly if he had stopped or given up. There are few things more spirit-moving than watching a friend or family member fight their demons and win. There is almost nothing more inspirational than seeing another human being reach for, and grasp, their own great potential. The point of this post isn’t to set Mike on a pedestal – though there is much to admire. Rather, my point here is to share the story of an “everyday hero” – not a perfect superhuman, but an ordinary person reaching for their best. 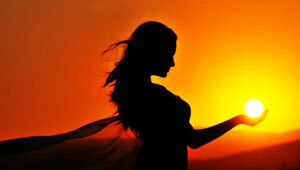 Each of us carries the seed of that everyday hero within – that best person we have the potential to be. Becoming that best self is hard work. It requires commitment and diligence and vision. It asks us to find a path to our own transformation. And while that sounds like a tough road, Mike’s journey also shows that it is a path toward joyful and energetic engagement in life. Today, on his 55th birthday, Mike is planning to celebrate. But his eyes are focused forward, already taking the first steps on the next phase of his journey to become the best Mike he can be. At 55, he is proof that it is never too late to become the person you hope to be. It is never too late to change. And it is never too late to offer inspiration to those around us. 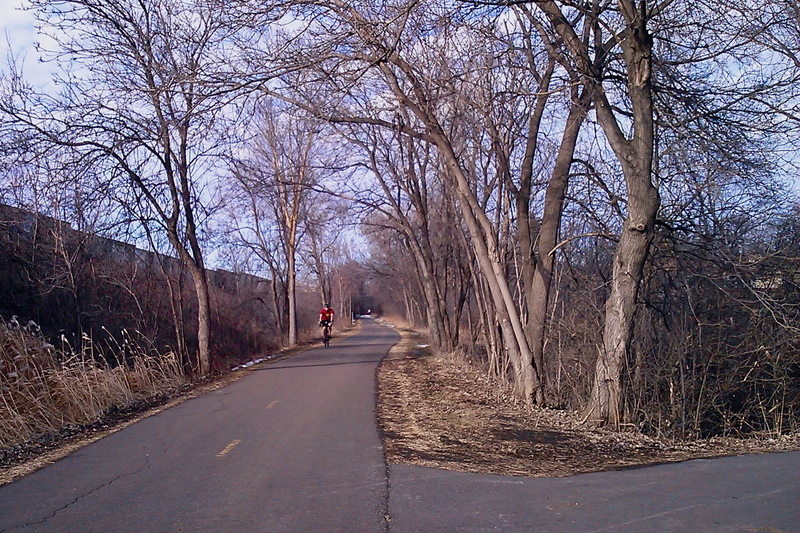 Regardless of what the weather brings in the next few weeks, it is clear that spring has arrived in the Twin Cities. While February was brutally cold, we had a fairly mild winter by Minnesota standards – and after the hellish winter of 2013-14, I am incredibly grateful for that. As spring arrives, I feel all of the hopeful emotions that we ascribe to the season: new life, fresh opportunities, and an increase in energy associated with warmer weather and beckoning sunshine. In the same way spring opens up the possibilities for engagement and activity, it also offers a chance to take stock: we emerge from the dark months of winter, from our warm but confining cocoons and take a look at what winter wrought. Last summer I wrote a post called “Stop Weighing Yourself“. In it, I wrote about a variety of ways that we literally and figuratively “weigh” ourselves, and in so doing cause self-harm. I’d like to say that this winter I took my own admonitions to heart – and I did in some ways. For one, I literally stopped weighing myself. My bathroom scale became a platform for dust, just another surface that should be wiped off regularly but (mostly) isn’t! The problem is that I am a person with a life-long eating disorder – when I’m stressed or anxious or upset, I don’t manage my food intake with reason and sanity. My fall-back position is to manage my diet with my emotions. And this winter, my emotions repeatedly told me I needed baked goods (cookies mostly, but also bars, muffins and donuts) to get through the day. This habit of eating bakery began in the summer, when I was logging over one hundred miles a week on my bike. It was no big deal, just a treat. The arctic cold arrived and my riding came to a dead stop but my daily baked treat habit continued. I couldn’t bring myself to stop when I was stressing about my job or whether my car would start, when I was feeling lonely and isolated from friends. I could tell as winter progressed that there were extra pounds being added to my frame – the way my clothes fit, what I could see looking in the mirror, additional body aches and pains were all clues. One of the great things I’ve discovered, though, is that gaining a few pounds has not caused me an excess of either panic or shame. In the past, I would have been trash-talking myself nonstop. Now, though, I realize that it is possible to veer off course without seeing that as a sign of personal worthlessness. Not all that long ago, I lost half my body weight – 176 pounds, y’all! – by creating habits that helped me hold myself accountable for making positive choices. I can reinstate those “get on track” habits any time I want or need. So a weekly weigh-in is back in my life, though it won’t be used as a measure of self-worth. Instead, it will simply be one of several tools I use for my success. In a related development, the past several years I’ve worked very hard in the winter to make certain that I stayed in good physical condition. This has meant remaining active, working out regularly, and finding creative ways to move rather than be sedentary when the snow, ice, and mercury fell. Not this winter. I really struggled to get myself moving. This was due, in part, to working full-time in a job that requires me to be on my aching feet the entire shift. But if I am truthful, it had more to do with feeling overwhelmed by emotions of inadequacy and scarcity as I continued to look for sustaining employment. Rejection is difficult, but repeated and sometimes inexplicable rejection can take a toll on self-confidence and resilience. Both of these qualities were at low ebb for me this winter. As I have joined my fellow Minneapolitans in celebrating the suddenly warm weather by getting outside and active, it has become clear how much my level of fitness has been impacted by these factors. But one benefit of years of regular physical activity is that my body remembers how good it feels to move. One afternoon of cycling in warm sunshine was enough to activate muscle memory, and to engage my physical desire for more. And when your body feels good, resilience of spirit returns, as well. I’m ready to take on new challenges, including some opportunities that I might not have considered in the past. Taking stock after the winter, it is clear that there are items to be added to both the “gains” and “losses” columns. While I’ve gained weight, and lost physical condition, I’ve also gained perspective on body issues, and lost the self-shaming. I’ve gained resilience and lost unreasonable barriers I had placed on possibilities for my life. In winter, many things appear to be dormant. But when spring arrives, we discover that growth was silently, secretly taking place below the surface. And with this discovery, we find ourselves ready to spring forward toward new challenges, ready to embrace new growth and successes. 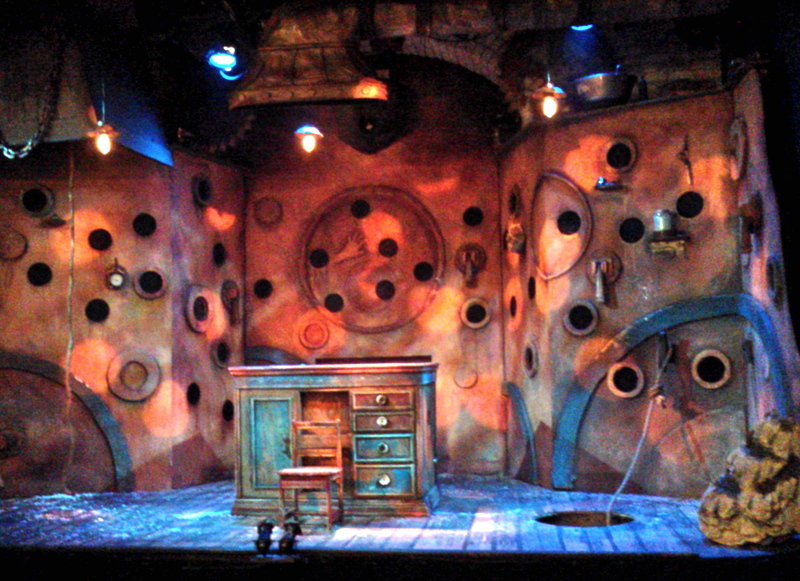 Imagine sitting in a darkened theater, a strange and colorful set (such as the one pictured above) on the stage in front of you. You have come to this performance, as have those seated around you, with no notion what to expect: you’ve not read a plot synopsis, you’ve never seen a different production of this play, you don’t know anyone connected with the performance or the theater. The show has not yet started, but it is that moment when the rustling and murmurs of the audience have hushed and all attention has been focused toward the stage. It is the moment of pause before the action begins. And in that pause is infinite possibility. Something definitely will happen – but what? It could be – quite literally – anything. You don’t know. The person beside you doesn’t know either. You could begin naming possibilities and never hit upon exactly the one thing that will happen. Or you could guess it on the first try. Who knows? In our information-overloaded age, with everything we ever wanted to know (and much we NEVER wanted) available to us in a moment, we’ve all become hooked on knowing “the poop” in advance. We have googled it, street-viewed it, tweeted and instagrammed it, asked Jeeves or Bing or Siri to tell us all about it. We rarely enter voluntarily into experiences that we haven’t heavily researched ahead of time. I get it. There are practical reasons to know what we’re getting into. For example, we can dress appropriately. If we will need to provide our own sustenance, we can pack a lunch. Like all good Boy Scouts, we can “Be Prepared”. I also understand that there are emotional reasons for getting the skinny on things before we agree to enter fully into something. Our fears are calmed by facts. Our hatred of being seen as socially awkward is assuaged if we’ve researched appropriate etiquette and attire beforehand and follow the norms. All that said, I want to argue for intentionally seeking those “pauses of infinite possibility”. I want to argue for intentionally allowing organic experience to unfold with our willing participation. Two years in a row I’ve attended the annual two-night concert event sponsored by our local public radio station to celebrate their birthday. The first year I didn’t have time to research the bands who were performing, the second year I purposely didn’t check them out in advance. I knew nothing about them or their musical genres. Consequently, I entered each performance completely open. My entire brain, not to mention my dancing muscles, engaged. I was inspired, moved, energized, and led to try other new experiences that I would have been otherwise closed to. As someone who aspires to creative pursuits in my life, I’ve discovered that these moments allow me to access what has been called “beginner’s mind” in a way that I have difficulty doing in the normal course of my life. The attitude of openness that characterizes beginner’s mind is one that defies our need to control by knowing. The Zen teacher Shunryu Suzuki says: “In the beginner’s mind there are many possibilities, in the expert’s mind there are few.” When I’m writing a story, seeing myself as the expert who is telling the story is a quick way to kill any glimmer it has. At each decision point in the storyline, I must be open to infinite possibilities or I write my characters into corners they can’t work their way out of. There are many big and small ways in life to bring ourselves into these moments of possibility – in addition to the many well-researched, well-crafted, well-planned-and-executed experiences we have each day. The most important one, in my opinion, is the practice of saying yes to the unknown. Yes, I’ll see what it’s all about. Yes, I’ll try it even though I may not be good at it. Yes, I’ll do it even though I haven’t stalked it to death on Facebook. Yes, I’ll sit in a dark theater, before an empty stage, and wonder what is about to happen. Yes, I’ll enter fully into the pause of infinite possibility. *Note: the title of this post, and the stage in my photo, are in homage to the Open Eye Figure Theatre of Minneapolis’ production “Nothing Is Something“. This production, created and performed by LIz Schachterle and Noah Sommers Haas, directed by Joel Sass, is a fascinating, magical exploration of a mysterious workshop. The show is fantastic, and if you are in the area, well worth seeing. Click on the link to learn more!